Catalogue image of a French antique spiral staircase, dating from the 19th century. Villa d’Or is specialized in the reclamation and salvage of French antique architectural building materials as well as manufacturer of French antique model staircases. Since its creation in 1995, Villa d’Or has become an international reference in the area of interior decoration due to its range of unique products. As well as French doors, French stairs are a concept by its recognizable form (spiral) and material (cast iron). 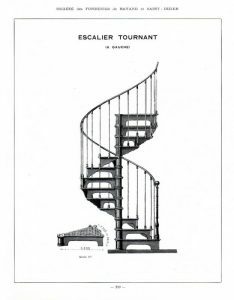 The history of French staircases goes back to the industrial period, the Victorian era: from the second half of the 19th century to the beginning of the 20th century (La Belle Epoque). This period is highlighted by the city of Paris with the construction of its Eiffel Tower. During this period, the French brought the art of casting to ultimate heights with their spiral stairs. French stairs are unique masterpieces, characterized by its timeless appearance and beauty. Known for their luxuriousness and artsy nature, French spiral staircases have been found throughout architectural history, popping up in churches, castles, mansions and more. And now you’re able to have one inside your house. Besides staircases, Villa d’Or is also manufacturer of forgotten art pieces like the garden bench ‘Le Banc Ideal’ coming from the Claude Monet garden in Giverny, France. Or what to think of industrial table feet. Each and every Villa d’Or piece is unique and recognizable with the purpose to add character and value to your home decor.